Natural gas has broken below a key support level visible on the daily time frame to signal that a longer-term drop might follow. 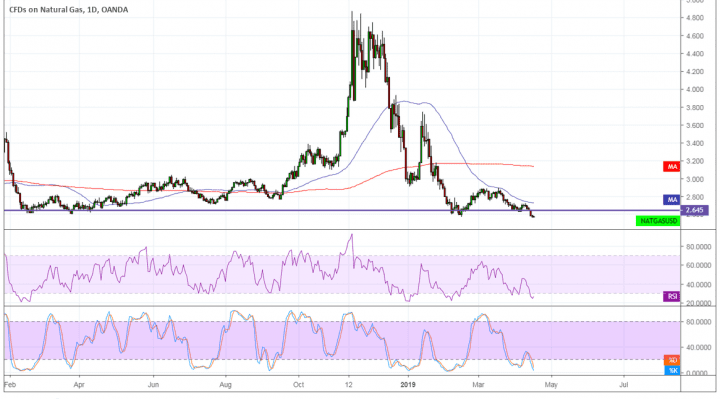 Price seems to have made a convincing close below the $2.650 level and technical indicators are showing a likely continuation. For one, the 100 SMA is below the longer-term 200 SMA to confirm that the path of least resistance is to the downside. In other words, the selloff is more likely to gain traction than to reverse. The gap between the moving averages is widening to reflect increased selling pressure as well. RSI is pointing down, also reflecting the presence of selling pressure, but is dipping into the oversold region to indicate exhaustion. Stochastic is in that area as well but has yet to turn higher to suggest that buyers might be returning. Expectations of a large build in stockpiles are putting more downside pressure on prices since it’s likely that these will stay in inventories while demand peters out. Some analysts predict that the oversupply could even beat 2018 levels, especially since natural gas demand tends to reach its yearly low around May. Meanwhile, global market sentiment is also on shaky ground as central banks are acknowledging the slowdown and shifting to a less hawkish stance. This could dampen business outlook and also hurt investors’ demand for riskier assets like commodities. Still, the latest EU extension for Brexit eases some of the market concerns somewhat, possibly stemming some of the declines for high-risk assets. Another factor to consider is the push by the Trump administration to pursue so-called energy dominance, which translates to more production and the opening of more pipelines, possibly putting more pressure on an already oversupplied market.